Other artists may have asked their fans to pay for a meet and greet, or for taking picture or shaking hands, but Leehom has spent US$ 17,000 to treat his fans on a brand New Day of 2012. 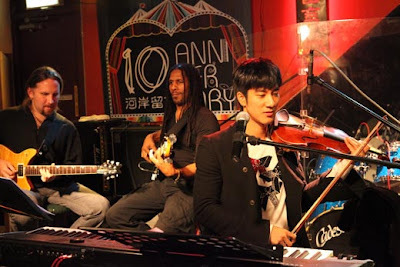 2 new year's count down live performance at Taichung and Kaoshiung were just not enough. He had this idea to treat his fans. So right after that past-midnight performance, he posted a messange in his chinese facebook, weibo. ‎0101 - 2012/01/01 in addition of Happy New Year, the first day must come in a special way! Finished crossing over a year, I think I'm still not satisfied... just discussed it with band and we decide to have a show on January 1st at 8 PM in Taipei Riverside Gongguan (Roosevelt Rd. 3rd Section Lane 244 No. 2 B1) Managing a '24 hour notice' for a free show, haha! The idea was to give you all a 24 hour immediate notice! It's possible to come earlier to grab a seat! See you tonight! 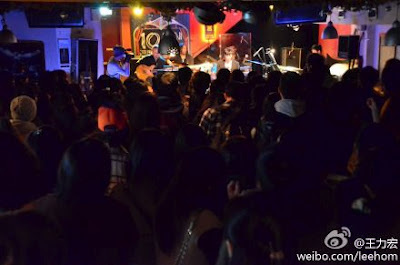 In less than 24hours, more than 700 fans were rushing to Riverside Live House in Taipei, and 200 of them were lucky to get the free mini concert tickets. he's over excited that night, a little bit drunk, maybe. Wonder when he woke up on that day, late in the afternoon I bet, he'd still remember what he posted. LOL! he's really a super hyper person. He's probably consuming Korean ginseng everyday and needed a place to throw that energy out. Haha! he loves performing, he just couldn't get enough of it, which makes me somehow feel glad.. I will be able to see him performed for a more more time to come. well, US$ 17,000 was probably small money for him. From what I know he got at least US$200K from 1x performance only. Recently he's no 16 at China Celebrity 100 list published by Forbes in term of activities, earnings and exposure. Whatever the reason was, using Social Media to promote something is I think was a brilliant idea! and that 45min planned performance turned out to be 2 hours show. Lucky fans. Way to go Leehom!